We created this collection as a way to experiment with different quilt shapes. We find that a square or rectangle block is a perfect way to frame our embroidery designs which is why those are the shapes that we usually use. 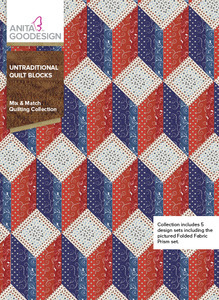 I am excited to present our Untraditional Quilt Blocks collection for you to enjoy. We’ve included the shapes to create 10 different quilts. The styles vary from plain blocks to folded fabric blocks, and they are all created in your embroidery hoop! If you tried to create these designs using traditional quilt piecing it would take hours and hours to figure out all of the different angles. We did all of the work for you so you can enjoy creating beautiful quilts with a lot fewer steps. The trickiest part about designing this collection was figuring out a way to make the designs compatible with our Mix and Match collections. All of the blocks are fully compatible so you can even add these designs to our other Mix and Match collections. 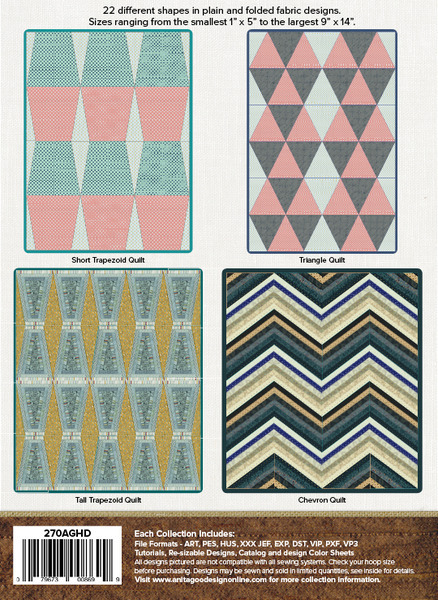 The following pages will show you all of the different ways to enjoy our Untraditional Quilt Blocks collection.